We will see where we can find inspiration and some tipps for create sprite.Creation is a complicated procesus. I will give you an advice: Don’t stop to look and search! Even from different console, i look often SNES-GENESIS-Gameboy Advance or Color, even arcade games. Everybody will learn something even on a bad Game, a surprising genius thing is waiting for you. Check the game on a video to see animation of sprites. 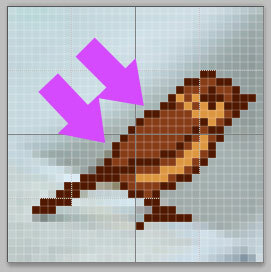 Find the sprites and try to recompose the animation you like. Export it as a gif. You will learn a lot! Daily they post a thema, then a lot of pixel-artist create something and post it. It can show you different style and give you inspiration. We don’t born already Programmer, Baker or Artist. People around you can think it’s magic to create a website, tasty bread or something else because they don’t understand how to make it. We know how to do it because we learned it. Create something is a technic to learn and it’s take time. Like an athlete, we need to have a training. Everyday, we need to make the same things. A training to prepare our eyes, hands and brain. Drawn sprites or BG will never come in one day. If we don’t train us, it will be never happen. Watch a lot, play a little bit and collect what you think can be good. Make a archive folder with scans, comics, Anime, Old paintings, flyers you find on the floor etc. All what give you inspiration, keep it, archive it and analyse it to see how it’s made. Do you have Museum in your city? Go direct to watch in real how artist paint something, go closer as you can on it. You can see how people use a technic to make you believing something, how to make a landscape from mass of painting. It’s different of pixel but the processus is the same. It can solve some graphic problem. 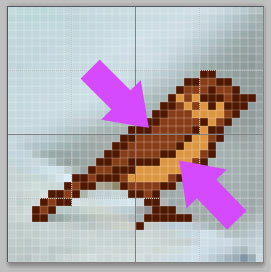 If you create with pixel, you need to understand one thing (more actually ^^). You will make nothing new, you will use the same technics as other creative people on last centuries before. Only the tools change. So please, watch old masters m(_ _)m.
Watch a lot of video games, find something to reproduce. Try to understand how people built the game. Analyse the different levels, palette, what is the 4th color of BG. 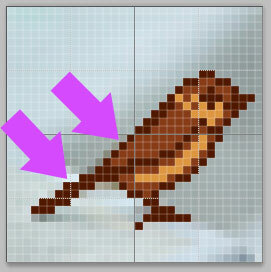 When you understand it, open some tools and play with pixels to reproduce it. We can test something on Photoshop. To try to make something realistic. Create a new Project. We need to activate our grid in case it’s not made already. If you forget how to make it, please read againt 1.5 Photoshop and Animation. 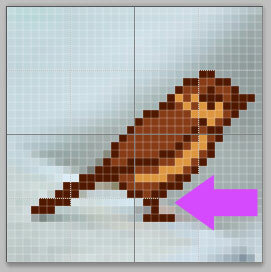 You will take the Pencil Tool (shortkey: B) and start to draw in this new layer over the bird. 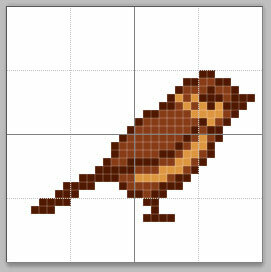 you can make stroke or to make all the bird in one color. Then Choose a middle tone color. 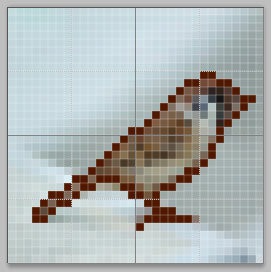 We will color inside the part who are also middle tone on the bird’s picture. Then take a light color, it will be the third and last one. You can now drawn inside the light part and but keep free the dark tone. We will work again on the wing part, to make them more clear. For this use the dark color on drawn a line between the two color (middle tone and light one). You can make a bigger stroke on his back. We will color totaly the Bird’s tail with the dark color tone. 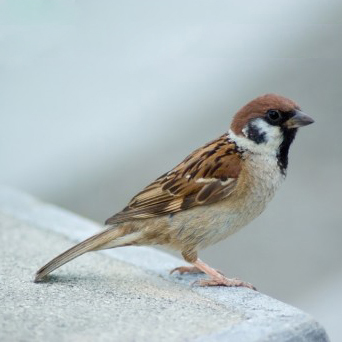 We will correct the Bird’s tail and his back. Make it thinner with the Eraser Tool (Shortkey: E). Now we will give him more volume. Make his body bigger (top wings part). For the end, we can correct his foot. 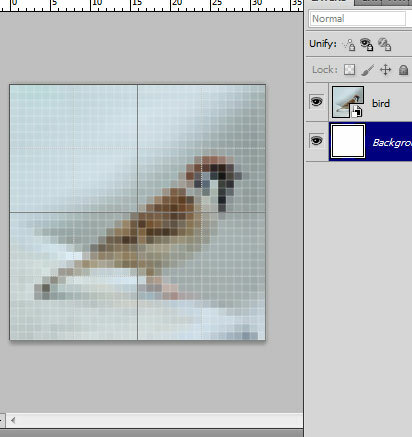 You can put away the layer of the Bird’s picture. Here’s your sprite! Don’t forget to save the project as psd. It’s nice, but it’s 32 x 32px size, so now you can test with other picture and smaller resolution (16x16px). It’s complicated but necessary. We need to be creative to propose something original for players. I don’t mean to make revolution in the Videogame domain. This will be stupid and arrogant. We need only to avoid to fall in the „boring area“. Change colors, play with them like a child. Even if you didn’t learn how to drawn, try it! It’s realistic and nice but if we start to make all like this, our game can be boring because it will be complicated to manage all your graphics and animation like this. Our CHR Bank will be going out of space fast. We can make something realistic but it will be better if we design differently the other characters. And this difference will give a style to our game! Nobody force us to make it realistic! So enjoy to play with colors and pixels! 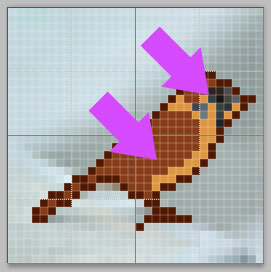 If you need to drawn a dragon, search picture to reproduce it and try with another color (pink or blue). Make bigger eyes, little tail, and so on! 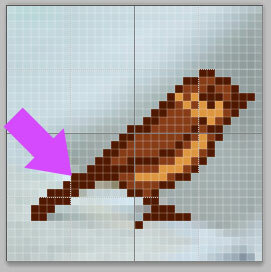 We have few pixels to use for characters, we can’t be realistic and maybe it’s better! We need to minimize everything, to express something and try to make understanding something „this pixel need to be an eye and not a nose“. Ask people to give real negative critic of what you do. The worst will be to receive nice critic because people are afraid to insult your work. The negativ critic push you to make better. Graphist need to have this kind of feedback. If you want to read about pixel-art experience, I advice you to read this article: A Pixel Artist Renounces Pixel Art. We will drawn again and again, even a sprite looking good today, will be horrible for you the next week. And it’s good! it’s mean you make progress. To be 100% satisfacted from the first stuff you make is actually strange. Try to experiment, to make something different, to play with tools. When you finish something, let it on the side and check it after sleeping one night. Maybe you will see something to correct. It’s the best way with graphic stuff, to put it away a moment. Then your eyes can rest a little bit, after a day it will be better to judge what you did. To be not satisfacted and frustrated is normal! It’s the same when somebody learn ASM and have the wish to program a NES Game (I guess ASM is the worst complicated part as Graphics ^^ ). Anyway, it’s take time to understand and to correct mistakes. Welcome to the nightmare of NES Pixel’s Factory!